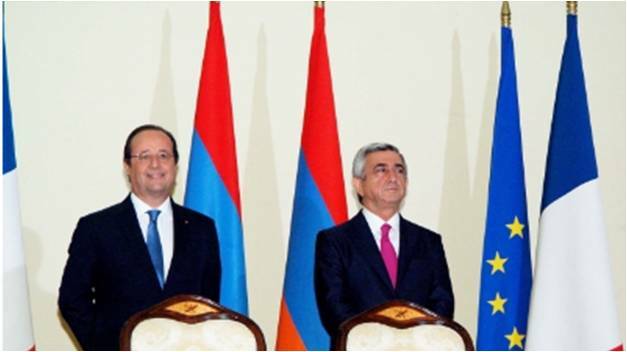 May 13, 2014 - YEREVAN (ArmRadio)—“Turkey must recognize the Armenian Genocide,” French President Francoise Hollande said at a joint press conference with Armenian President Serzh Sarkisian on Tuesday in Yerevan. 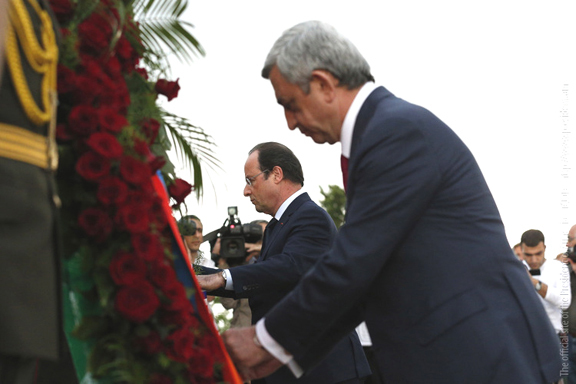 The French President reaffirmed that he will visit Armenia on the 100th anniversary of the Armenian Genocide. “This is a call to the world to prevent the recurrence of such tragedies in the future,” he said. “With this visit, France will once again reiterate its position that all genocides should be condemned,” Hollande said. Speaking about the Karabakh issue, President Hollande said: “As a Minsk Group co-chairing country, France is ready to do its best to find a solution to the issue. Although there is a ceasefire agreement, it’s not enough. A thorough resolution is needed,” he said. Francois Hollande added that France is ready to host a meeting of the Presidents of Armenia and Azerbaijan to help find confidence-building measures. There have been fears in the recent period that the confrontation between Russia and the West could negatively affect the cooperation between the Minsk Group Co-Chairs and their shared stance on the issue, which would, in turn, result in the reconsideration and change of their positions. Commenting on this, Armenian President Serzh Sarkisian said: “The Co-Chairs have said on many occasions that they have a united stance, which implies that the status of Nagorno Karabakh conflict should be determined through a legally binding free expression of will of the people. 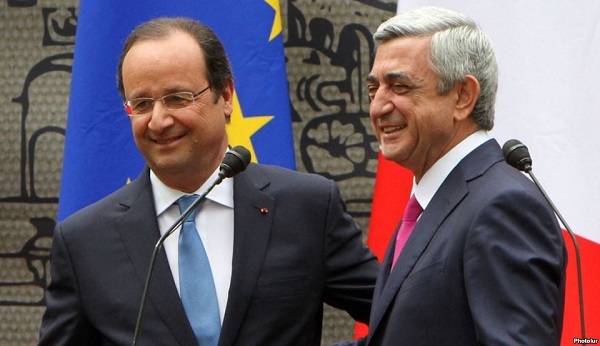 There is no alternative to the realization of the principle of self-determination,” President Sarkisian said. French President Francois Hollande pointedly declined to criticize Armenia for backing Russia’s intervention in Ukraine and voiced support for an Association Agreement with the European Union sought by the Armenian government during the press conference on Tuesday, RFE/RL’s Armenian service (Azatutyun.am) reported. Hollande, whose country has imposed economic sanctions on Moscow together with other Western powers, said he understands the motives behind Armenia’s de facto recognition of the Russian annexation of Crimea. President Serzh Sarkisian opted for it “in a certain political and geographic context” reflecting the traditionally close Russian-Armenian relations, he said. “I don’t want to judge. I want to understand, which is what I have done during this visit,” Hollande told a joint news conference with Sarkisian held at the end of his two-day trip. Sarkisian commented vaguely on the reasons why Armenia was one of the few nations that recognized a disputed referendum in Crimea that was followed by the region’s absorption into Russia strongly condemned by the West. “We have been friends with Russia for almost 250 years,” he said. Sarkisian reiterated that his government at the same time hopes to deepen relations with the EU through the Association Agreement. “We spoke with Mr. Hollande about that; it would be very desirable to have a special association offer to the Republic of Armenia,” he said. Armenia spent three years negotiating the Association Agreement with the EU and was on track to sign it until Sarkisian’s Customs Union U-turn announced last September. The EU abandoned the planned agreement afterwards, saying that its most important provisions relating to free trade are “not compatible” with membership in the Russian-led bloc. The EU’s executive body has since repeatedly rejected an Armenian proposal to conclude a watered-down version of the accord that would not contain those provisions.